Thank you for your participation in the HIP and FIT Month 2018 and congratulations to all Prize Winners! This is the photos link and the video link. Reminder: Please view/ use the photos and videos with RESPECT and RESPONSIBILITY. 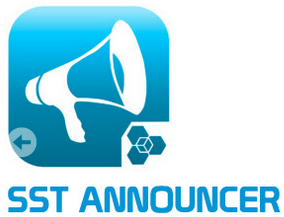 Info Hub will be closed from August 30 to Sept 7, for the September School Holidays. We will operate as usual on Monday, Sept 10. Excited about Teachers' Day? We're all ready to celebrate our teachers too! 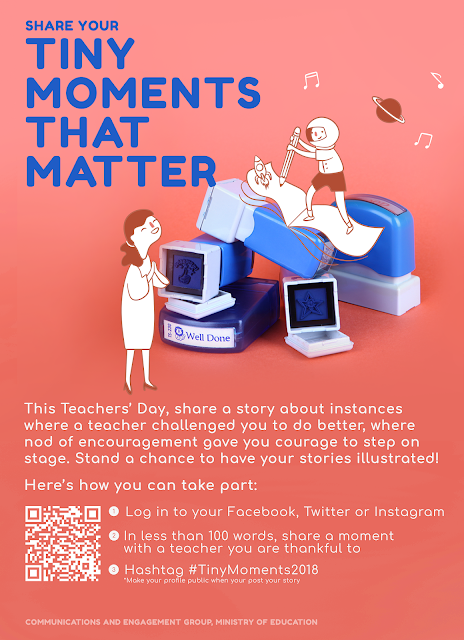 MOE is organising a contest and they want to hear how the little moments spent with your teachers have inspired you or impacted you positively. The best stories will be turned into an illustration and the winners will receive a copy of the illustration. 1. Write your story in a Facebook/Instagram post in 100 words or less. 2. Add the hashtag #TinyMoments2018 and remember to make your post public for the organisers to read. Do take time out to show your appreciation to your teachers and have a wonderful September break ahead! Please be informed that the programme for 30 August, Thursday is as follows. Attire for the day is School Uniform. 07:50 - 09:00 Class activities and End of term cleaning up. Lions Befrienders will be having their annual Flag Day on 25 August 2018 (Saturday). The funds raised will be used to support their operations to serve our seniors and help them age-in-place in the community. The details are provided below. If you are keen to help out, please sign up via their website: https://www.lionsbefrienders.org.sg/get-involved/flag-day-2018/. After you complete the Flag Day Service, please obtain an official document from Lions Befrienders stating your name and the hours you volunteered. This document must be signed by the personnel in charge or stamped with the official logo of the organisation. Then submit a copy of the document to Ms Madeleine Chew or Ms Wong Ho Yan within 2 weeks after service, personally or by email to madeleine_chew@sst.edu.sg / wong_ho_yan@sst.edu.sg. Please be reminded to bring along your reading materials for the reading period. Programme for S1-3 should end around 1030hrs. For S4, it will depend on your learning journey. This is an invitation to participate in the 2018 Australian Informatics Olympiad (AIO). The AIO is a 3-hour competition in which students must write computer programs to solve logic problems. Within each paper are four tasks to test the students' skills using C, C++, C#, Pascal, Java, PHP or Python. Students only need to know one of these languages in order to compete. Those new to programming may find Python the easiest of these languages to learn. The AIO will be held in SST on Thursday 23 August 2018. Students' solutions are submitted online. Please register by Monday 13 Aug 2018, 5 pm.